Blue Apatite Stud Earrings. Apatite Gemstone Earrings. Raw Blue Apatite Earrings. Apatite Stud Earrings. Gold Apatite Earrings. Gold Prongs. 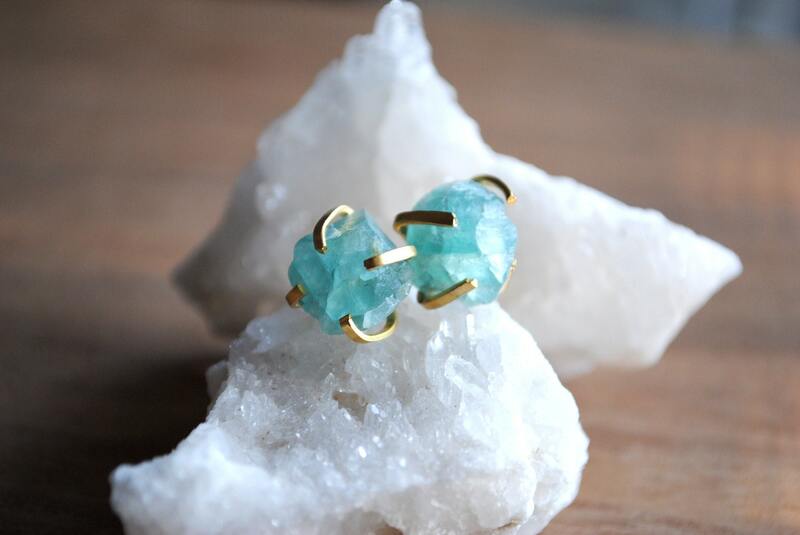 ⊿⊿ These earrings feature genuine natural raw cut blue apatite stones set within gold plated prongs. ⊿⊿ I have several of these available. Refer to the last image and make your selection at check out. The studs are about 7mm in diameter (about 1/4") and each pair is one of a kind (actual color will vary from the colors on your screen). Note that the prong setting will appear uneven as these stones are each raw cut and therefore the prongs will encase each stone uniquely. ⊿⊿ The name apatite comes from the Greek word 'apat' meaning "to deceive" which refers to the many variety of colors that the stone manifests itself in. It can be easily mistaken for other minerals because of this variety in color. Apatite is composed of the mineral phosphate, which is the same mineral found in the teeth and bones of all vertebrate animals, as well as any horns, antlers or tusks. Amethyst Triangle Slice Necklace. Raw Gemstone Pendant. Gold Plated on 18" 14K Gold Filled Chain. Purple Stone. Gold Edged Necklace. Beautiful earrings. I love the contrast of the blue apatite on the gold bands. The color is a little less vibrant than the image, but nonetheless it's still beautiful. It also feels very sturdy which is important because i was worried the gem might be too heavy for the prong, but that definitely is not the case.